Over the years, cruise ships have slowly morphed from floating hotels to all-out entertainment districts – including waterparks. Here are some of the coolest waterparks at sea. The MSC Seaside boasts an entire two-deck tall water park, called the Aqua Park. It includes an adventure trail and four different slides. There is a first on this ship as well – it is the first ship to feature slide-boarding technology, combining a water slide with an interactive game. The slides go out over both the port and starboard sides of the ship. The Aqua Park also includes splash zones and water spouts. Carnival is no stranger to action-packed fun, and one of the most iconic ways they create that fun is with their water slides and waterparks. Many of their ships feature WaterWorks, their onboard waterpark. There’s the Twister Waterslide, which is hundreds of feet long and one of the fastest and wettest waterslides you can find. Speedway Splash is full of racing action and cool lighting effects. WaterWorks also includes the DrainPipe, which is an enclosed slide, ending in a funnel that swirls you around like you’re going down a drain. The PowerDrencher dumps water on you and soaks you to the core – not for people that don’t enjoy being drenched! WaterWorks also includes plenty of waterspouts and other ways to cool off, so it’s perfect for everyone. 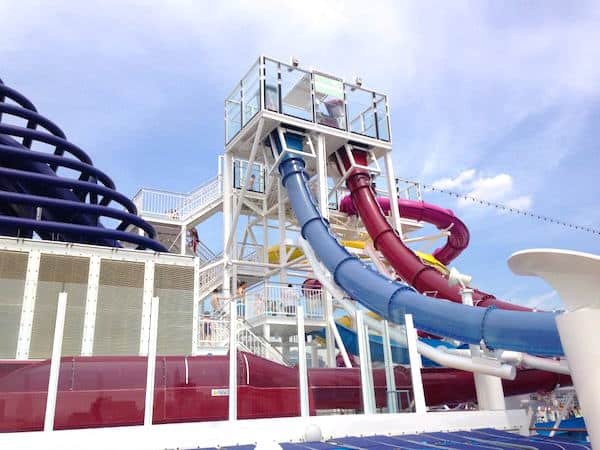 having made its debut in 2016, the Harmony of the Seas is sure to be a hit with water slide fanatics. It boasts three multi-level waterslides, which are ten stories high above Central Park, the main central area of the ship. These are the very first waterslides for Royal Caribbean, and they’re making quite a grand entrance, dipping down three decks with their twists and turns. For those that want to try their hand at surfing, the ship also features two FlowRiders, as well as an H20 Zone for sprinkler and waterjet fun. Norwegian’s Breakaway class ships are the prime spot for waterslide lovers. They feature five awesome multi-story waterslides. The most notable is Free Fall – the fastest waterslide at sea that drops you at a speed of 4Gs. The Whip is just that, two racing slides that’ll give you a big rush. There’s also a family slide and other wet and splashy fun on Norwegian’s waterparks. Other Norwegian ships have waterparks too, but not quite extreme as the Breakaway class. 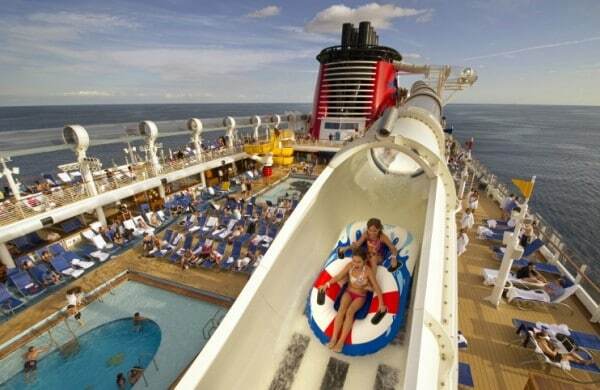 The AquaDuck is one of the crown jewels of Disney’s Dream-class ships – the Disney Dream and Disney Fantasy. It was the first water coaster at sea, debuting on the Dream in 2011, and followed by the Fantasy in 2012. The multi-story slide pushes you on a stream of water through an acrylic tube with twists and turns and transparent and opaque parts. It even goes out over the edge of the ship for a stunning view. At the end, it splashes you into a lazy river. If AquaDuck isn’t your thing, the family play area, AquaLab, is sure to please, with jets, geysers, wading pools, and bubblers. Do you have a favorite cruise line waterpark? We’d love to hear from you.